How do you color code them? I am using the service (which is awesome) but I can’t figure out how to change the color. Especially my default calendar which showed up as yellow. “Q: The colors of the calendars on my iPhone/iPod do not match the colors at Google. Can I change them to match? Nice Keith, so a half-truth in your post. 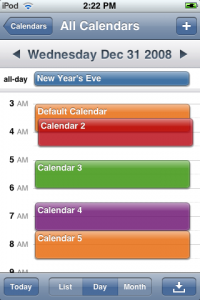 You should look into advertising…..
>>>>>separate calendars (which you can color code!). Yes! As long as you do not wish to choose the colors……….. I think Larry is less than pleased (as would I) with the Yellow color chosen for his personal calendar. Come on nuevasync! You nearly have it right! Sorry about that. At the time I wrote the article, my iPod touch was at apple for service, so I couldn’t test it out. But, the colors are still random. for example, my main color calendar is blue, the rest are orange, green, and red respectively. Try checking the calenders in a different order.